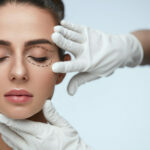 /How Much Does Eyelid Surgery Cost? At 740 Park Plastic Surgery, our board-certified plastic surgeons custom-tailor eyelid surgery to meet the needs of every individual, so an in-person consultation at our practice is needed to determine specific pricing. After a comprehensive examination and thorough discussion of your aesthetic desires, your doctor can provide a close estimate of the cost of your blepharoplasty, including a full breakdown of the fees that will contribute to the total expense. If you’re interested, a member of our team can also assist you in browsing various financing and payment plan options available through CareCredit® to help make treatment as affordable as possible for your particular budget. Like all other cosmetic procedures, it is important to keep in mind that you get what you pay for when it comes to eyelid surgery. Although lower costs can often be enticing, remember that price is many times a direct representation of the experience and skill of a plastic surgeon, as well as the quality of care you can expect throughout every phase of treatment. If you are considering blepharoplasty and would like a personalized price quote, please do not hesitate to reach out to 740 Park Plastic Surgery to schedule a consultation with one of our board-certified plastic surgeons.